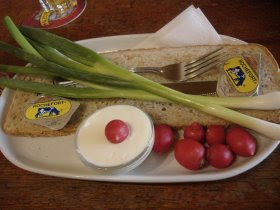 Thirsty Pilgrim: Mysterious Belgian Bar Snacks, Part II: Plattekaas. Mysterious Belgian Bar Snacks, Part II: Plattekaas. It's called plattekaas, or flat cheese, and the name is apt. It's white, creamy and bland. Normally it comes with radishes, onions, possibly shallots, and the most gigantic slice of bread you've ever seen. It's one half of the breakfast of old flat-capped Belgian champions. What's the attraction? By itself, I have no idea. 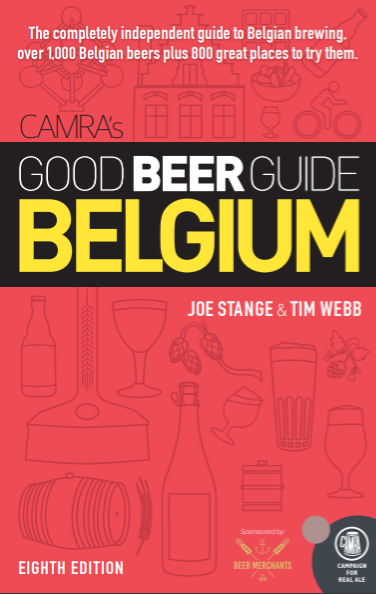 But it turns out the stuff goes pretty well with lambic, the other half of the breakfast of old flat-capped Belgian champions. Go figure. Pictured here is a plate at the famous Mort Subite café in the Brussels city center. In this case they pair the gargantuan slice of bread with gargantuan green onions. See that tiny fork in the photo? No, that's a normal-sized fork. Actually somewhat large, as forks go. Then you get to do all the cutting and spreading yourself. A lot of work, but I guess it gives us non-smokers something to do with our hands. Me? I prefer schepkaas. It's salty as all-get-out and smells like hell. But that's an entry for another day.